After writing hundreds of vaping reviews, it’s easy to run out of adjectives. There’s only so many ways one can say a mod is powerful, and that a tank produces clouds without it becoming redundant hyperbole. Then a device like the Asvape Michael 200W mod crosses your desk, and you dig deep into a special archive of words usually reserved for truly special products. This is one of those moments, because the Michael is – in a word – spectacular. One word alone does not make a review. 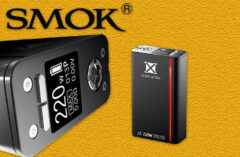 So, let’s dive a little deeper and see why Asvape’s signature mod needs to be on your shortlist of high-end devices. From tie to tail, everything about the Asvape Michael screams “high-end.” Though not as expensive as most DNA devices, the Michael still comes in at $104.95 at Element Vape, putting this in lofty air, as far as mods go. But the impressive packaging goes a long way toward conveying its value. The well-designed sliding box is reminscent of high-end mobile device packaging, while also doing a good job presenting and protecting the mod. Once you get the Asvape Michael in your hands, you’ll know it is something altogether left of center. First, you’ll notice the striking art design. 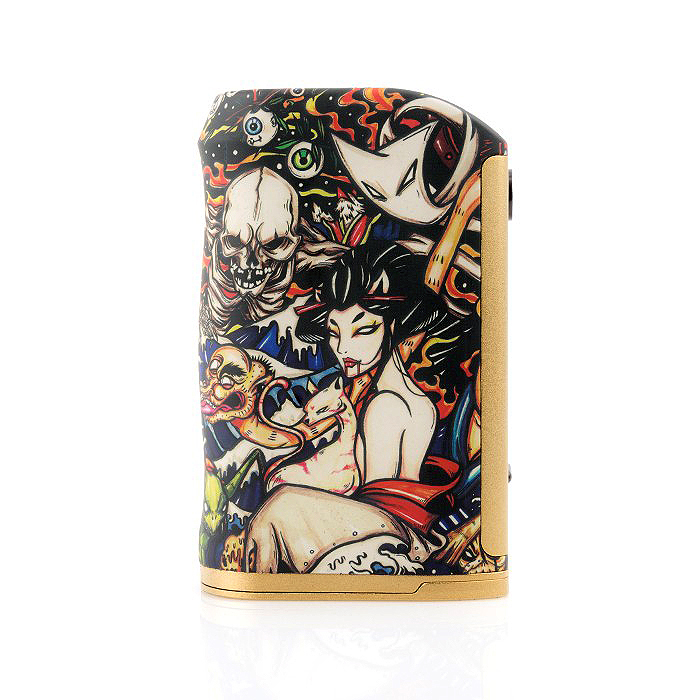 The Michael comes in two different designs, both of them centered on some hellaciously awesome artwork dubbed “Devil’s Night” and “Walking Dead.” I prefer my Devil’s Night edition, as it is both unsettling and beautiful, and somehow doesn’t look out of place on a vape mod. The art style can best be described as “dark comic/graphic novel,” with more than a touch of traditional Japanese flair. It is bound to be a polarizing element of the Michael, but for a heavy metal-loving, true crime-reading, all-around horror freak like myself, it couldn’t look better. Check out the gallery to decide for yourself. The artwork isn’t just a sticker, but rather a rubberized finish that is comfortable in the hand, despite the Michael’s larger size. 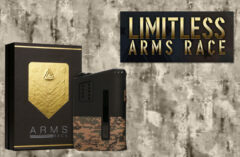 At 91x 51 x 34mm, with gothic artwork and gold/copper zinc alloy trim, there’s nothing subtle about this mod. I’m starting to think that was the whole point. On a more functional level, the Asvape Michael mod also features a standard sized screen that highlights the operation of the device’s vaunted VO200 chipset. Above the screen you’ll find a round, metal fire button, which has a good throw and clickiness, but could probably be a little bigger in proportion with the device. The offset 510 connection is gorgeous, with no signs of play, except, of course, on the spring-loaded pin, which accepted a wide array of tanks and RDAs without any gaps. 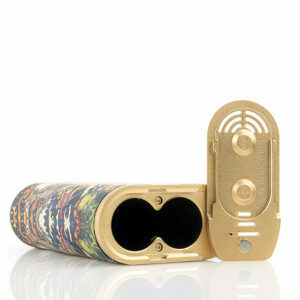 At 34mm wide, it seems as if the Michael can accommodate any atomizer in your collection. But there is actually a small “lip” on the rubberized finish that isn’t quite flush, leaving it to protrude slightly above the rim of the mod. My wider atomizers fit and worked just fine, but anything larger than 26.5mm will touch this lip, potentially making the fit less than flush. Below the screen you’ll find a USB port for onboard charging and firmware upgrades, alongside a surprisingly understated up/down control button – which could also use a little more width and bulk. On the bottom of the device lives one of the few complaints I have about the Asvape Michael mod – the sliding battery door, which is far too loose and unsteady for a device of this magnitude. Even with batteries installed, there’s an uneasiness about the door, which comes off far too easily, and never seems to quite fit as intended. A minor black mark, but a negative all the same. Is the Asvape Michael functional art? Given the forward appearance, it might be easy to dismiss the Asvape Michael mod as an expensive showpiece, rather than a top-tier vape device. But I’m happy to report the Michael can throw down with the absolute best of them. It may be dark and evil on the outside, but in action, it’s smooth and sweet, every step of the way. The VO200 chipset (full overview of the VO200 here) is impressive, to say the least. As “high-end” chips like YiHI and DNA’s offerings become more affordable, a larger group of vapers are getting to experience the customization and control that come with this technology. 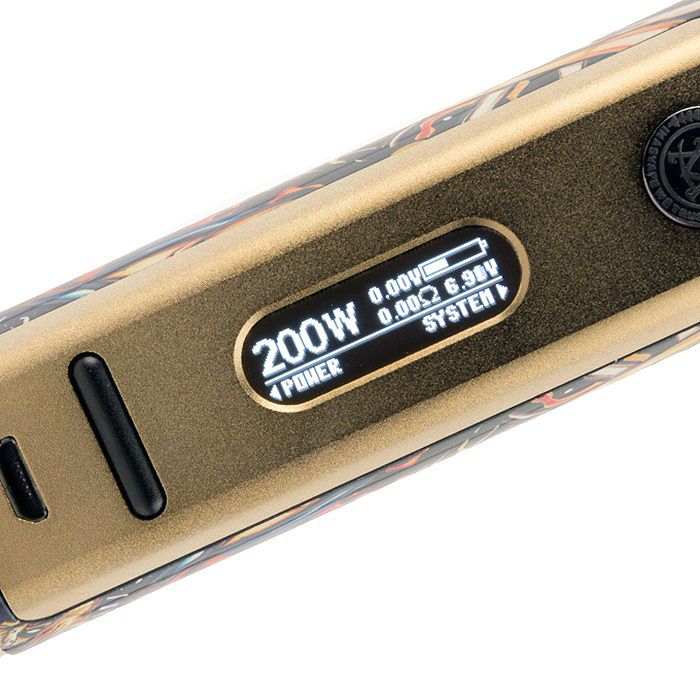 Supporting variable wattage, a full slate of temperature control options for all major wire types, bypass mode, adjustable wattage curves and manual TCR adjustment, the lion’s share of modern vapers will be more than satisfied with the Michael’s offerings. In practice, the chipset does a great job making adjustments in the menu. But it’s surprising that the free, Windows-only VO Editor software is used solely for firmware updates, rather than offering a comprehensive platform for adjusting wattage curves and TCR settings. It’s hardly a dealbreaker, but having used eScribe and YiHi software, this seems a little spartan by comparison. The VO’s user interface is straightforward enough, though the mod often wants to lock itself before you complete the five rapid clicks it takes to enter the menu tree. But, like most devices, once you have the muscle memory down pat, it’s fairly user-friendly, and won’t seem much different than similar interfaces. 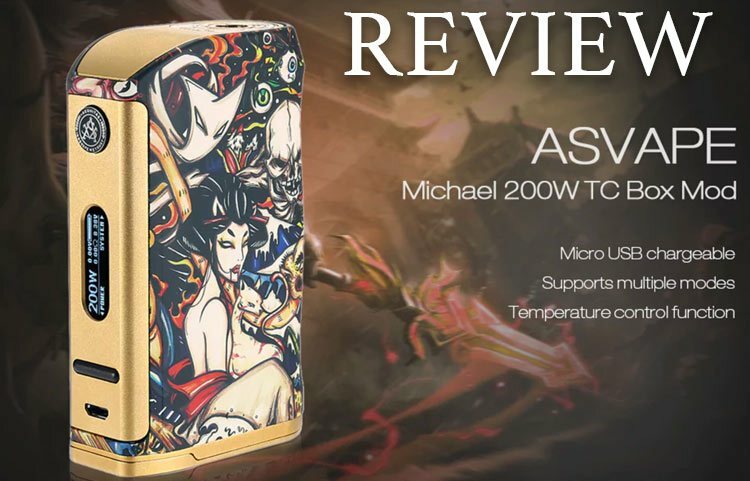 The Asvape Michael VO200 200W TC Box Mod is a joint collaboration between Asvape and VO Tech to create a stunning chassis design with an advanced American VO200W Chipset, capable of setting Variable Power Control Mode with Five Memory Banks. In wattage mode, there are few mods that offer such a pleasant experience at high settings. 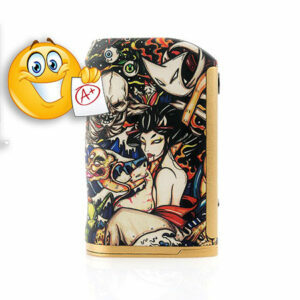 The Asvape Michael mod hit its full 200 watts in stride, never faltering with misfires or underpowered hits. I may not vape this close to the sun too often, but I know when it’s being done right, and the Michael does just that. At more reasonable wattages, the Michael shines, with quick, precise firing that never feels like it’s struggling to keep up. The device itself stays cool to the touch, partly due to its thick, rubberized coating, but also because of the ample venting on the battery door. I spent hours with the Michael, trying to find a tank, RTA or RDA that would throw it for a loop. But none ever did. Performance was accurate, powerful and unwavering throughout – even with the more temperamental tanks in my collection. I thought I had finally managed to “beat” the Asvape Michael using the SMOK TFV-8 Cloud Beast, with RBA deck in place. But the atomizer short warning turned out to be user error, as the RBA screw came a touch loose, and the VO chip responded in short order. A quick tightening, and I was back in business without a hitch. In temperature control mode, the device performs equally well, with easy-to-use settings and a nifty auto-temp-detection mode that chooses an ideal temperature for the coil, based on your coil selection. The chipset tends to err on the side of caution, and is often conservative when auto-setting. But this is a welcome decision that takes into mind the target audience. Ultimately, I preferred setting my temperature manually, but for beginners looking to dabble in TC, this is a great way to learn the ropes. Battery life on the Asvape Michael is outstanding. On two fresh 18650s, I vaped at 100 watts for nearly 10 hours before the cells started to waver a bit. The battery meter was a little overeager at first; I saw the display show 50% power for nearly six of the 10 hours. But when the batteries got low, the Michael was right on the case. On paper, the Asvape Michael 200W mod goes against everything I typically like in my vape devices. I usually value reserved design, palm-friendly size, and a decided lack of flash. Yet, since the Michael arrived, it hasn’t left my side. The large chassis is unbelievably comfortable, even with my small-ish hands. 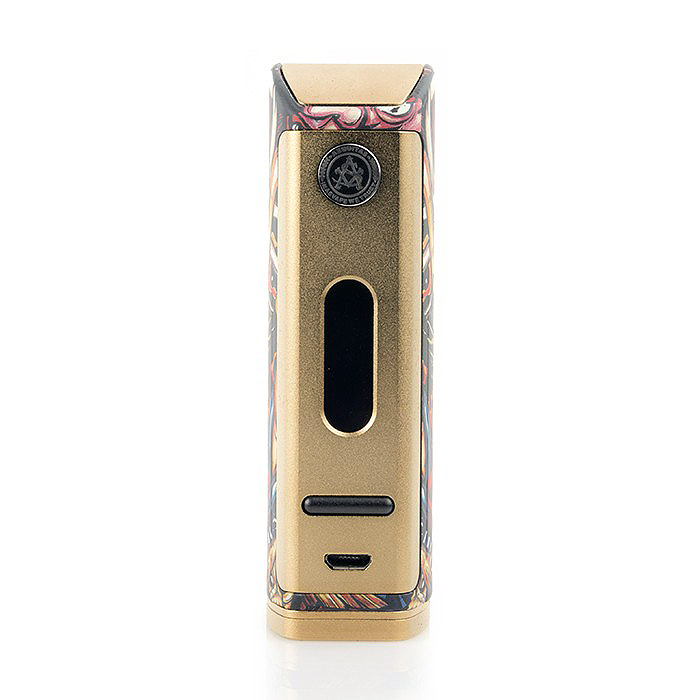 The bold artistry and gold trim somehow come together nicely, and stand out against a sea of black and silver mods that occupy my desk. Most interestingly, the Asvape Michael is the first mod I’ve vaped in TC mode for longer than an hour. Everything about it, from aesthetics to operation to power, reflects a phenomenal experience. Of the few minor annoyances I had, only the loose battery door will likely bother anyone else. It’s the only real black mark on an otherwise stellar piece of vaping gear. As a reviewer, I tend to forget about test devices the instant my articles are published. Very few of them stay in my rotation, and even fewer get used every day. The Asvape Michael just joined a very exclusive club, and may have pushed my other “go-to” mods to the back of the line.